According to the Department of Veterans Affairs, there are 22.7 million veterans in the United States. Fully 55% of these people are age 60 and older. Many of the veterans benefits now available are not relevant to these older veterans or are no longer available to them; but, there are still benefits to assist older veterans that are not being utilized to the fullest extent. In addition, we have found that many of our nation's seniors, whether veterans or not, are struggling with a myriad of financial and emotional challenges in their final years of life. Our mission is twofold. First, we are dedicated to helping elderly seniors who served their country receive cash support or other services available from VA. Second, we provide a national website listing of dedicated professionals to help senior veterans better prepare for their final years of life. This national network of providers and advisers includes financial advice, legal help, preparation for eldercare, education on government support programs, care provider services and much more. Although we concentrate on helping senior veterans, we will not turn away any veteran who comes to us for help. This twofold approach to supporting our valiant elderly veterans, who served our country in a time of need, will improve the dignity, financial staying power and well-being of these valued American seniors. Under the right circumstances, the VA Program called Pension can provide up to $2,230 per month for a veteran couple or up to $1,881 a month for a single veteran in additional income. To get these benefit levels, these people must be paying for expensive long term care at home, in assisted living or in a nursing home. Death pension for surviving spouses can provide up to $1,209 a month in additional income under the same circumstances. 1. 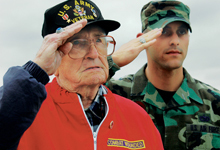 What is the veterans aid and attendance Pension benefit? 2. Who is eligible for the Pension benefit? 3. Understanding the special case of long term care medical costs. 4. Using the aid and attendance benefit to pay any person for care in the home. 5. Using aid and attendance for professional home care services. 6. Using the veterans aid and attendance pension to pay for assisted living. 7. Using the veterans aid and attendance pension to pay for a nursing home. 8. Understanding the application process for Pension. 9. Submitting a claim for the veterans Pension benefit. 10. When the family can submit a claim without help. 11. When the family should use an advocate or field service officer. 12. Health care benefits for veterans receiving pension. 13. Dovetailing Medicaid with the aid and attendance benefit. 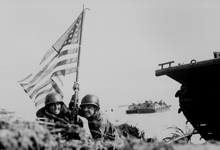 A remarkable World War II experience recounted by Colonel Jack Leroy Tueller. One underutilized benefit available to many senior (wartime) veterans/widows is pension -- commonly called aid and attendance. Because aid and attendance is such an important benefit, we provide an entire section below describing it. These individuals may or may not be accredited through VA. Non-accredited advocates understand veterans benefits but are not allowed to help in the filing of a claim. All advocates can answer questions relating to specific benefits and can direct a potential claimant to an individual or organization capable of filing a claim. Advocates do not charge a fee related to filing a claim. The Senior Veterans Service Alliance maintains on this website a list of individuals -- primarily attorneys -- who are willing to represent veterans in appealing adverse decisions on claims. Although no fee may be charged in connection with filing an initial claim, a fee is allowed in regard to representing a veteran with a claims appeal. The fee that is charged must be reasonable and VA must see the arrangement. SVSA takes pride in being an organization that can help you locate a full spectrum of care by connecting you to services for older adults, veterans, and their families. Dependents Indemnity Compensation is payable to eligible survivors of a military service member who died on active duty or whose death after service resulted from a service-connected injury or disease. DIC currently pays $1,319 a month to a surviving spouse and additional amounts if there are dependent children or if the spouse needs aid and attendance. Disability compensation is a tax-free benefit paid to a veteran for service-connected disability that happened as a result of active duty, active duty for training, inactive duty training or injury from VA healthcare. Special benefits like car allowances, housing allowances, clothing and so on are payable for severe service connected disabilities.